I'm starting off with one of my newer pieces, the Matador Skirt from Pinup Girl Clothing, as I only got it as recently as Black Friday. Honestly, this wasn't a case of love at first sight when I first saw it on PUG's website. But the more I saw genuine matador skirts pop up on eBay going for sometimes hundreds of dollars and the more I saw some of you lovely ladies sporting this skirt on Instagram, the more and more it grew on me! Unlike past years, I've recently grown a strong affinity for red and green being together in patterns (despite that I'm not a Christmas person ha!) so that didn't hurt the process of falling in love with this skirt either! I can't wait to find different ways to wear and style this in the future-especially as summer approaches! On a more personal note, I'm also a feminist so I love that they made this a lady matador! 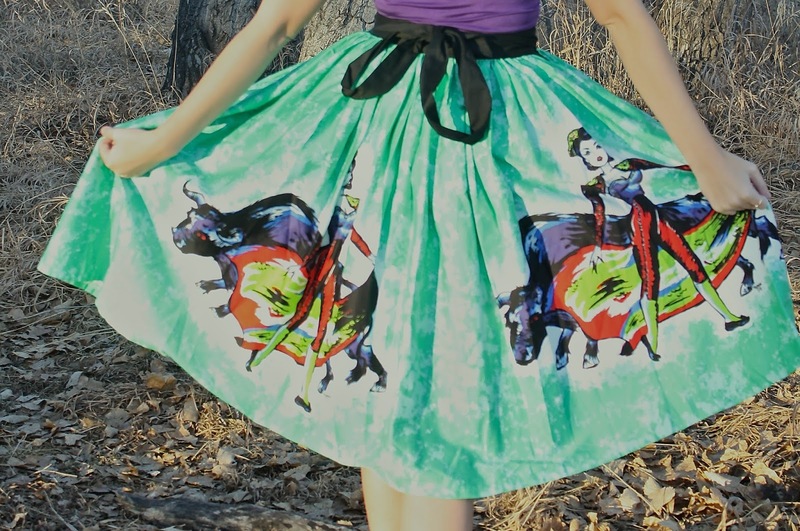 (You very likely won't find a lady matador on the actual vintage skirts like this!) And, I think it's a fun skirt for me to wear because 2014 brought me down in some ways and I'm finally rebounding from all of the junk I had to deal with. I don't want to jinx myself, but I've been feeling incredibly mentally strong lately and just feel ready to (pardon the pun) grab life by the bull horns so even if it sounds cheesy, this skirt is symbolically fun for me! I'm not going to do this every Saturday, but I feel like this skirt's size should be pointed out. I'm typically a Small in PUG Clothing, but after reading the measurements on the site it appeared I should be a XS. I ordered this in an XS and I'm mega glad I did because it fits perfectly. There are buttons inside the skirt that make it adjustable, hence it fits a little different than the PUG skirt I'm most well versed in (and I know a lot of you are too), the Jenny Skirt. (If you must know, I'm a size 25-26 inch waist, depending on how much I'm running on a regular basis. I prefer skirts to be 26-27 inches because they sit closer to my rib cage, and after sitting and eating that extra inch is just a lot more comfortable). Thank-you! I've recently become obsessed with collecting the pinup tops from Le Bomb shop lol. It's such a great store!! !